There is feverish excitement in the air on 19 January as some thirty scientists and engineers gather in one of the two Payload Monitoring rooms at the mission's Science Operations Centre at Villafranca. Everybody knows that a new milestone is being reached. On one of the consoles, the very first data are arriving from the EPIC-PN camera. The packets of information are being displayed practically in real time with the Quicklook Analysis software: the black window on the screen is progressively being filled with minuscule white dots, like flecks of dust, representing the count of X-ray photons reaching the camera's detectors. Only five minutes after the start of the exposure, the X-ray points are getting bigger at one point and clearly assuming more importance. The colour coding chosen in the Quicklook software is gradually giving this spot a thin yellow fringe. Everyone peers at the on-screen revelation: an X-ray source is appearing! Ulrich Briel gives a thumbs-up and glows with delight. "Not only is the telescoping pointing precisely in the right direction and we're seeing that our camera works, but look!" exclaims the EPIC-PN team investigator, "We are already identifying what is probably supernova 1987A." He holds up an image taken several years ago by ROSAT. No difficulty in recognising the same features. The first exposure is a trial run and lasts only 20 minutes. A few moments later, Konrad Donnerl also from the Max Planck Institute EPIC-PN team is already working offline on the raw data. "It is just what I have been waiting for! After having used simulated data, of a somewhat uniform and predictable nature to calibrate our instrument over the past years, it really is exciting to have this real data. There is a whole new depth to my work." Indeed, as he patiently handcodes the lines of his software to remove background noise in the image, one fully understands that XMM-Newton is now offering the scientific community a truly new adventure. The spacecraft's payload is given just a few minutes to breathe - time to readjust certain parameters - before the EPIC-PN camera starts a new exposure. But this time it will stare at the same sky region for 11 hours, a duration much more representative of X-ray observations that will be XMM's routine fare starting next June. Everyone knows that this second exposure, will register far more X-ray counts and reveal XMM's true worth. During the evening, the Optical Monitor camera is switched on to obtain a complementary visible light view. Its data, downloaded and viewed on screen, shows literally thousands of stars. The eleven hour EPIC-PN exposure ends at 04:30. A bottle of champagne is opened to celebrate and it is time for a quick nap. Because everyone must be at the 10:00 morning teleconference between VILSPA and the ESOC Mission Operations Centre. But the immense satisfaction that everyone shares dispels any feeling of tiredness. All those on the line in Darmstadt are a bit jealous after the report given to them by Fabio Giannini, XMM payload systems engineer, and Jean Clavel XMM science operations manager. "Could you email us a copy of the beautiful picture?" asks Mission manager Dietmar Heger. There are a few software issues to diagnose and correct but everybody agrees: the spacecraft is extremely stable with no trace of elongations or smears in the images, the XMM mirror modules are focusing perfectly, the EPIC-PN camera is working correctly, and the Science Operations Centre infrastructure, processing and recording the data coming down from the spacecraft is functioning well. To better understand the first X-ray image that has been obtained, Ulrich Briel displays the ROSAT reference picture which had been taken with a four hour exposure. He details its various features and then superimposes the XMM-Newton image. Not only everything corresponds, but the new pictures show much more. Everyone is greatly impressed. EPIC Principal Investigator Martin Turner from Leicester University UK. concurs: "It is a brilliant, astounding result. We can all be very pleased." 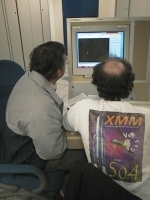 As the XMM spacecraft passed its apogee point on its 21st revolution and started returning towards Earth, the offline processing of XMM's own 11 hour exposure picture had already started at VILSPA.